LIKE all big things that have a small beginning, the making of giant photomurals was just a little idea back in 1927, when Mrs. C. B. Goodspeed of Chicago walked into the photo studio of Kaufmann & Fabry. She carried with her a 4×5 negative of India’s famed Taj Mahal and explained to the skeptical Messrs. Kaufmann & Fabry that her idea was to have a picture large enough to cover the entire wall of an alcove in her home. Mrs. Goodspeed departed but did not give up. And finally, when the studio consented to project the negative, it was found to everyone’s surprise that it had been correctly exposed and developed. Even when enlarged to twenty-five diameters on the screen, the superior quality of the negative nullified all opposition to the undertaking. After that showing the studio was compelled to accept her order. “We realized that we were attempting something without knowing the rules, but there was nothing hit or miss about our procedure. Every step was carefully plotted out and our subsequent operations have closely followed that first experience. When the strips were eventually joined on the alcove wall, the images matched within less than a quarter of an inch. “Mrs. Goodspeed provided the paper-hanger, but we furnished paste, just to be sure he did not use anything injurious to the emulsion. The paper was applied direct to the plaster, which, as learned from later experience, might have brought disaster. This first job was saved, however, because Mrs. Goodspeed had asked for a ‘gold tone’ finish and $50 worth of pure gold bullion was used to produce it. Between that gold coating and the lime no chemical action occurred and today, after nearly twelve years, the world’s first photomural still hangs there in all its original bright perfection. It was not until three years later, in 1930, that the commercial possibilities of photo-murals was realized by Kaufmann & Fabry, when they were asked to decorate the walls of a Chicago night club’s reception room. Here, after preliminary consideration, a drawing, 6×20 inches in size, the work of the artist, Aaron Douglas, was enlarged to fill every inch of wall space in a room measuring 51×20 feet. H. M. Pettit, the artist who specializes in bird’s eye drawings, had made a picture visualizing how the fair would look when completed and the exposition’s president, Rufus Dawes, thought it would make a fine ornament for the administration building’s reception room, “if it could be enlarged a bit.” So Kaufmann & Fabry enlarged it quite a bit. Pettit’s picture was 26×40 inches in size and the completed photomural was 20 feet, 6 inches high by 35 feet long. “It was our first real ‘whale,’ ” remarked Mr. Clason, “and gave us our first experience in excessive height and multiple sections. The first photomural had been made in three sections, but since our projector could only throw images about ten feet long, this fair job required thirty-three sections. Today, incidentally, sections twenty-four feet long can be printed without difficulty. This installation introduced the world to the possibilities of mammoth photographs as a new form of wall decoration. After seeing it, fifty exhibitors placed orders for giant pictures for their 1933 exhibits. Next year this number increased and meanwhile other studios had also begun to produce the new style pictures. 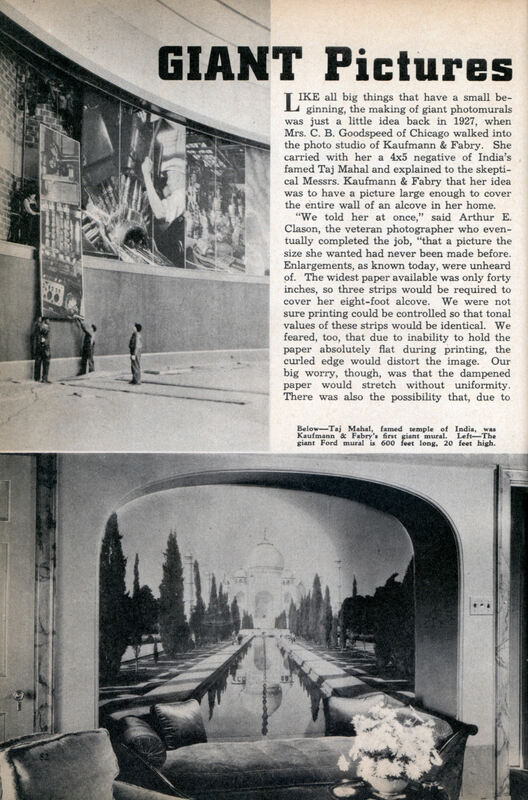 It was for the 1934 fair that Kaufmann & Fabry made the world’s largest photomural for use by the Ford Motor Company. It approximates 600 feet long and twenty feet high and is composed of ninety-eight steel-framed panels. Subjects are scenes around the company’s plant, made from negatives 4×5 or 8×10 inches in size. 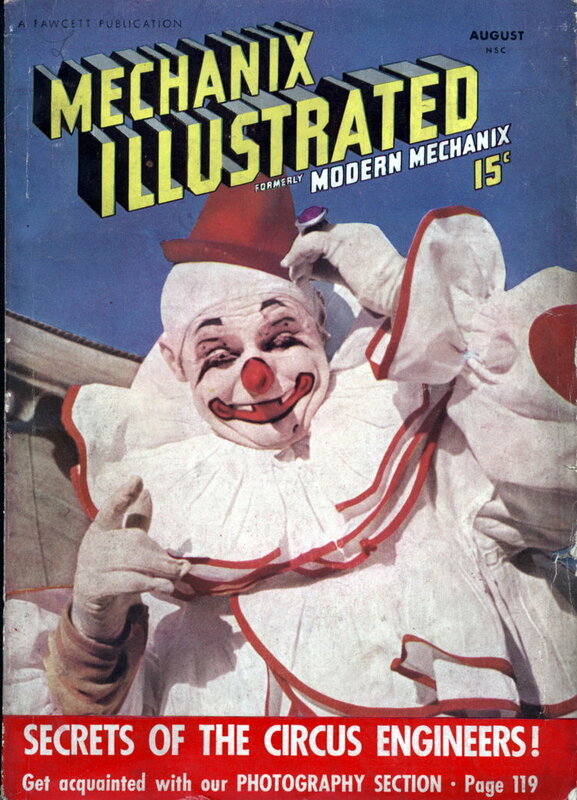 Nearly one mile of photographic paper, forty inches wide, was required, together with 12,000 feet of plywood for backing, 200 gallons of paste, half a mile of chromium metal moulding and other materials in proportion. The big picture now hangs permanently in the Ford “Courtesy Building” at Dearborn. Photomurals are now employed for wall decoration and other purposes in an infinite number of situations. Some twenty distinct types have been created, ranging from the continuous over-all panorama, to the frieze and the removable panel. One of the most talked about examples of a giant picture made from a pigmy print was installed at Miami, Fla., where a tiny “shot” 3-1/2 inches square, was magnified to a height of 23 feet, 9 inches, with a total surface area of 27,360 square inches. Considerable mystery prevails as to how photo-murals are made but essentially the process is identical to what any amateur home photographer follows. As the first step, the photomural engineer surveys the room. Then he constructs a miniature scale model so that a photograph, properly reduced in size, can be studied in position with respect to balance and composition and for estimate of costs. The negative, after retouching to remove blemishes, now goes to the projection room. The screen is a sheet of sensitized photographic paper tacked to the farther wall. On this the negative’s image is cast by a huge projection camera. This machine, 4x6x8 feet in dimensions, rests on wheels running along a four-foot gauge track. With its lenses, condensers and 5,000-watt lamp of airplane-beacon type, the camera weighs 450 pounds. Special ventilation apparatus keeps it cool and an ingenious device protects the negative from the lamp’s heat. After exposure the long strip of paper is developed in large tanks. The developing process is like that employed in ordinary photography. Tanks vary in length up to ten feet and a large job consumes about 800 gallons of developing solution. Following the fixing bath, the photomural moves to the washing tanks. Constructed of stainless steel to eliminate chemical action, these hold 400 gallons of water, filtered and tempered and made to circulate around, up and over the paper. Again timing is carefully clocked and chemical tests are made to detect the slightest traces of hypo before the loops of paper are lifted out and adjusted on drying racks of steel webbing through which air circulates freely. The “skiving” process which follows involves tearing the side edge of the print on a bevel, so that two sections may be lapped together with the least possible visible joint. Mounting is done in various ways, depending on the job, but in most cases a strip of chemically pure white muslin serves for an immediate foundation. Specially developed paste prevents chemical action that might cause blemishes. A “spotter” then inspects the job to eliminate minor defects that escaped the retoucher’s magnifying glass. From the negative to the wall on a small job might be a matter of less than twelve hours for a crew of two or three men. Larger jobs call for more men and more time. That development of photomurals has not been as simple as this account sounds Mr. Clason emphasizes. He has seen “hot spots,” caused by unslaked lime in the plaster, start discolorations that ruined an entire job. Lengthy research was required to determine the chemical effect of muslin on photographic paper and a dozen types of wall board were investigated before suitable mounting board was selected. Photographic paste went through various changes in formula. When atmospheric gases were discovered to cause discoloration a search was started for the right kind of lacquer to use as a protective agent. This formula was also revised several times. Photographic supply companies have made many changes in paper stock to provide a more uniform and stronger paper base for photomurals Sensitized paper is commonly made in rolls 300 feet long, but recently the largest roll yet manufactured was specially produced for one job. It was 750 feet long, and its absolute uniformity of emulsion guarded against variations in tonal values during the printing process. Improved negatives have also contributed to higher quality of artistic finish. Constantly changing technique has called for new apparatus all down the production line and the business of making photomurals is now well established on a sound technical basis. Photomurals in natural color are, for instance, being discussed as a future achievement. Interesting processes. I spent part of my misspent youth (1972 to 1979) working in darkrooms. A company I worked for was able to produce color and black & white photo prints up to 60″x72″ in size. The photo paper was processed by machine, much easier than using the tanks described in the article. According to the link provided the price for an ounce of gold in 1927 was $20.64. Sorry, heres that link to gold prices.